This is the second article of the reloaded series. As we said before, in reloaded articles, we will link the older posts, write answers in post format of the things you have asked us often through emails, comments and most important point: the series is incredibly easy to read and understand. We wrote an article ago dedicated for these errors. Problem is that, if you want to mean contact us and typed contact US no spell checker can correct it. We also wrote about eight common mistakes done in another article. So, the thing is that you must pay attention to the writing while writing and not do other common things. Not that blog writing is like doing meditation, but still it is not like sending a text message to your closest friend. Size means not word count, but the feeling. A post of 200 words can make anyone sufficiently bored on the other hand one 1200 word article can make the reader to read more from your blog at the same sitting. If we start to write about change-logs of WordPress here, 99% chance you will close the browser window. You might have read one article we published ago about WordPress 3.2. It went popular and still we get visitors for that post, the reason is, Google tries to find popular articles; it positions almost all posts from a good website among the top 50 results; when it sends the traffic to the website it notices user behavior: how fast the reader closed the page, how much time spent, how many pages went (how deeply surfed the site in other word). You can understand if that post had list of change-logs, it would not position there; simply because people would close it early after seeing the list of horrible digits with dots. So, make it nice to read. You probably can name a writer of your favorite Newspaper who writes serious articles in a funny style. You remembered him or her because of the writing style. Target audience can be classified as geographical location of the visitors and for whom the articles are written. 80% new bloggers do not think about these and that causes the shut down of the blog within a year. We get visitors mainly from U.S. and India. Although almost visitors from every country visits this website. So, our English should be clear and readable for the most. If it was targeted for India, we would use the terms which are popular in India. There is already many working example in this post. Simply, link to older posts in a meaningful manner with nice keyword enriched anchor texts. A picture is worth a thousand words and a Youtube video worth a million words. Illustrate and decorate your post with images. Problem with videos is page loading speed. One of the best solutions for all major blog platforms is Akismet , developed by Automattic, the creators of WordPress. This filter can be used both WordPress as Movable Type through a plugin. It also works those runs on php4 or php5. Askimet is very good and also free. Google Re-captcha. Enough to filter out many automated spams. We wrote an article ago on how to moderate the comments on your blog. There is no reason to make this post looking like an epic. Some way to deliver your post updates via email. Free option is Google FeedBurner. Pinging, ping-o-matic is a service from Automattic again. Give free download stuffs those are legal. Please use a font size that any one can read. Use an author box but do not (please) write all your degree, diplomas, certificates etc or which company you work. Briefly mention about you. It is very important part. You can hire a professional CV writer for serious a blog. If you want to declare about your where you work, use the About Us page. Mentioning academic achievements has higher value and looks professional. This Article Has Been Shared 1003 Times! When one writes a blog on a regular basis, one of the main challenges is to produce relevant content, unique and interesting to the readers, all this on a regular basis. Here are some ideas about what to write on. Here are the most important tips for budding bloggers covering writing plan, making money to search engine optimization. 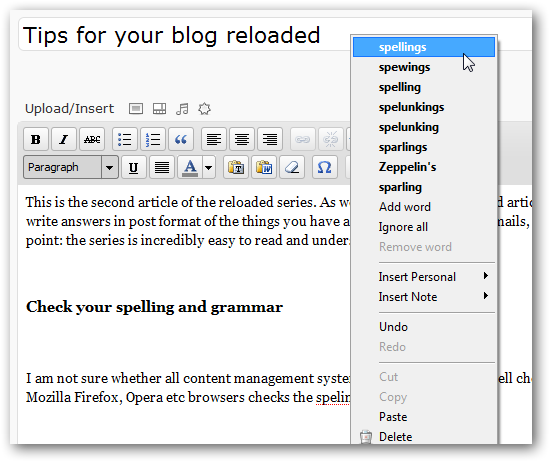 Cite this article as: Abhishek Ghosh, "Tips for your blog reloaded," in The Customize Windows, May 11, 2011, April 24, 2019, https://thecustomizewindows.com/2011/05/tips-for-your-blog-reloaded/.